Trouble knows what an inukshuk is. It’s a pile of rocks for other dogs to mark in their predictable fashion, and for Trouble to sniff. 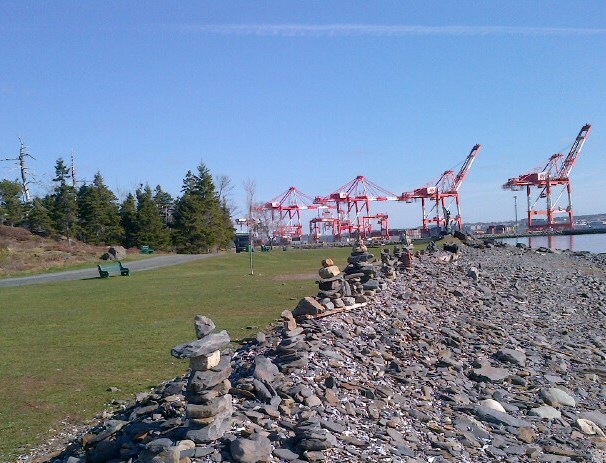 It was odd, then, one Monday morning in spring, to find Point Pleasant Park marked with a series of inuksuit, of varying sizes, along the shoreline ledge of rock and shale and shells. No individual effort could have constructed them all between this visit and our last. Had someone instituted an inukshuk installation? Thrown a beach party with a difference? Tried to rival Clam Harbour’s Annual Sandcastle and Sandsculpture Contest? Perhaps it was just an attempt to make us smile. These inuksuit were not saying “You are not alone.” First of all, we are never alone in the Park, for it is one of the most popular places in the city. They weren’t saying, “You aren’t lost,” because the shoreline path is impossible to lose. They weren’t saying, “This way to the container port,” for they were too small for any ship’s captain to see. Perhaps, in juxtaposition with the cranes of the port, they were intended to highlight the contrast of industrial and natural. Or evoke, as I couldn’t help thinking, a flock of ungainly geese with trailing goslings yet to acquire their adult colouring. In other words, the message, if there was one, was lost on me. 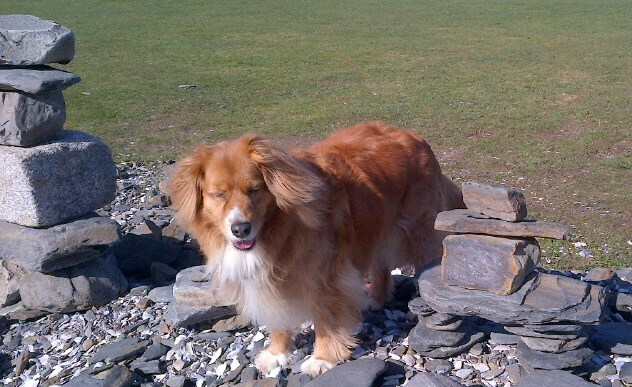 (Trouble found much to absorb her, but it was from the aforementioned other dogs, not the stones themselves.) Out of its ordinary context, the text which is an inukshuk just didn’t work. Multiple versions didn’t make the message any clearer, just as repeating your words, ever more loudly, to someone who doesn’t understand your language, doesn’t work. In James Kinneavy’s* terms, then, this is a piece of discourse that, if intended to be informative or persuasive, failed. That leaves two other possibilities: it could be expressive discourse. “I was here,” it says, like any graffito on a fence or name on a bathroom stall. Or it could be artistic discourse, in which the text, the work, is the most important thing, crafted to stand on its own, to be interpreted and appreciated for what it is. Anyway, it made me smile. And Trouble? Look closely. Trouble decided to roll in something smelly. *James Kinneavy. “The Basic Aims of Discourse.” College Composition and Communication 20.4 (1969): 297-304. 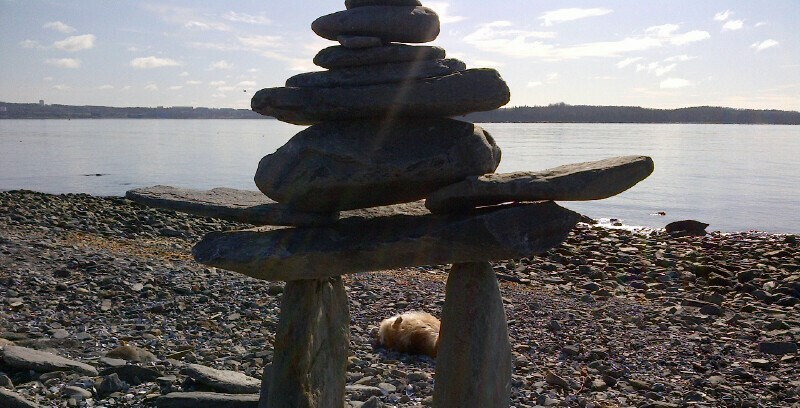 This entry was posted in Aims of Discourse and tagged expressive discourse, failure to communicate, inukshuk, message on March 13, 2015 by Susan Drain.